DERRY GAA: Let’s lose the lawyers claims Derry County Secretary! County Secretary Danny Scullion (right) with former chariman John Keenan. 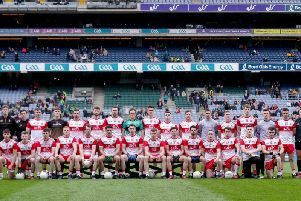 Derry Secretary Danny Scullion used his speech at the County AGM to call for players and clubs to back the disciplinary systems at both county and national level. Mr Scullion described discipline within the local game as relatively good but said he was worried about a growing trend at county level to challenge decisions through lawyers, a practise which he believes undermines the association. The clash of professional lawyer with amateur committee member is something which should be a real cause for concern across the Association. “Whilst discipline has been relatively good throughout our club championships and leagues in 2015, it is disappointing to note the general trend throughout the association to the use of lawyers and loopholes,” explained Mr. Scullion. “This is not new but it erodes the spirit of our games. We see this increasingly at national level and it sets a worrying trend for others to follow at local level. Our disciplinary committees act at all times with fairness and without favour, often in difficult circumstances and I would urge clubs and members to only follow alternative avenues where they feel there has been a real sense of injustice. “We must be honest and be seen to be honest in accepting punishments rather than fostering a culture of litigation and loophole. The clash of professional lawyer with amateur committee member is something which should be a real cause for concern across the Association. Mr Scullion also paid tribute to the hard work of the county’s committee members and club secretaries who have contributed to another excellent year.